*Disclaimer: I am not a professional stylist. Please be careful and use caution when cutting the hair that frames your beautiful face. You did a great job demonstrating cutting your own bangs. I’m a licensed cosmetologist and just wanted to give you some of the terms for the techniques you used. When you cut up into the bangs, it is called ‘point cutting’ and it will texturize them; taking a little bulk out so they aren’t so heavy and the same length. Great job! One of the best tutorial on this subject I’ve seen! I just watched your video and tried this method and it worked out PERFECTLY! This is the way I had my bangs for years. I completely grew my bangs out and had it that way for a year, but when I missed them and wanted them back there was no stylist that could cut them the way I’d had them in the past. You have just made my life so much brighter with this tutorial! I love your blog, you are a joy to watch :) Thank you! This was awesome! 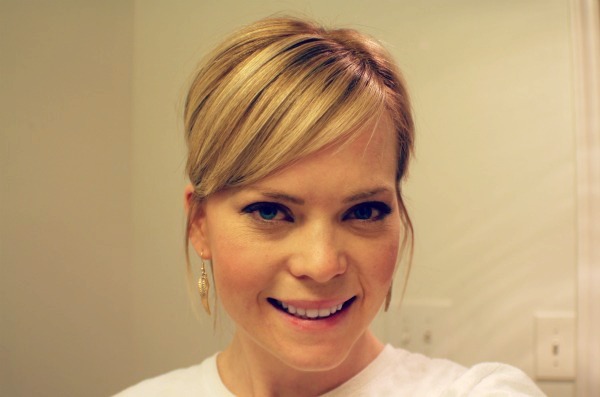 I just finished cutting my bangs using your tutorial and it was so EASY and it looks great! Thank you! this was terrible I did not work!!! Seriously, seven (yes, SEVEN) professional hairdressers/senior stylists later….I followed your tutorial exactly and my bangs have NEVER LOOKED BETTER!!!!!! I could kiss you right now if you were standing next to me!!! I swear I had walked into hair salons before and said “I will pay any kind of $$ for the best of the best, most senior stylists, whoever… whoever can PLEASE cut my bangs so they don’t look like Edward Scissorhands did it” And every single time I walked out with a total mess on my face! Never again!!!! I will cut my own bangs exactly the way you showed us here for as long as I live, LOL Needless to say – THANK YOU!!!!!! P.S. those who didn’t have amazing results following this tutorial, if I had to guess I would say you used the wrong scissors. Get professional scissors, specifically for hair (you can get them at Sally’s, cheap). But it truly matters. Thank You so much Melissa! I have tried several types of bangs and had several different people cut them, but I always hated it, but I don’t like having no bangs either. I followed this tutorial and it has been several weeks now and I LOOOOOOVE them! For the first time ever I love bangs on me! Could you post a list of different kind of bangs and their names. I’m sure lots of people would benefit from it. You are adorable! I loved this video and can’t wait to give your method a try. Thank you!! Oh Melissa, you are the best!. I shall give this a try and watching your video, I felt braver now :). You’re very pretty too. Thanks so much. HUGS. Thank you so much! This was super helpful. Thank you! Finally had a chance to cut my bangs and I love it! You. Are. Amazing! This method works perfect. Thanks ! You seem so nice! This looks very helpful. Thanks! Yes, PLEASE show us how to style your bangs. I dream that one day my bangs will look just like yours :) Thanks!! Thanks! I’ve been trimming my bangs for a while and I’m going to do it your way today.I can never style mine awesomely. Can you do a video on how you STYLE your side swept bangs? Or is the secret in the cut?! Ah, this is SO helpful!! I have extremely long hair, and wanted something that would let me have a longer bang (mine falls under my chin, even after cutting). I just did your method, and it looks great! Thanks for this tutorial. last Feb. my bangs got too long. I just grabbed the scissors, pulled my hair up and whacked them off. Oh my gosh, what a mistake. My bangs were totally uncontrollable. I went to a hair dresser the next week and she tried to fix them but they still are stupid. They curl up and look ridiculous. I wish I could get them to grow out so I can fix them but my hair only grows about 1/4 inch a month. This will take forever. Thanks for the video. I’m going to do this from now on. Just found your tutorial on pinterest. Thank you Thank you! I’ve been looking for something like this. I know I can trim my own bangs but didn’t know how to do the sideswept bang. You did a great job of explaining! This may have just changed my life. I, too, am always growing out my bangs and then cutting them. When I re cut them, the stylist takes several tries to get them the way I want. I just ran up to my bathroom and tried those and PERFECTION! Thanks you! You have another loyal follower on Pinterest. I tried this (thanks for the post) but it didn’t turn out as nicely as yours. But perhaps that’s only because I have never cut my own hair before and feel that people can see that I did it myself. I love the way my bangs turned out! Thank you so much, great job! I just tried this because the last time I got a haircut they didn’t cut it short enough. It totally works! Thank you so much! Love this, those swept bangs look so gorgeous on you! Can’t wait to watch the video! Thats exactly how I cut my bangs… the only thing different is that I cut mine so they are the legth down to my upper lip as I part my hair a bit lower. You are the cutest! I love this tutorial. 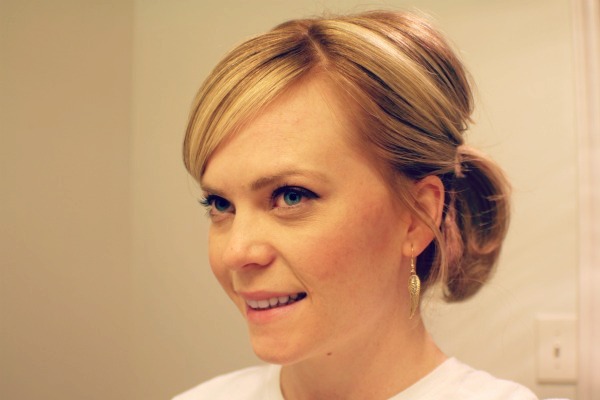 my sister has used this same technique on my bangs in the past and it absolutely works! You’ll never guess what I did yesterday – cut this exact fringe into my daughter’s hair!! Now I’m off to neaten it up following your FAB tutorial. Thank you! !